A few months ago we ran the back cover of Direct Currents #16 from May 1989. Turns out that back cover was a tie-in with an article within that issue. 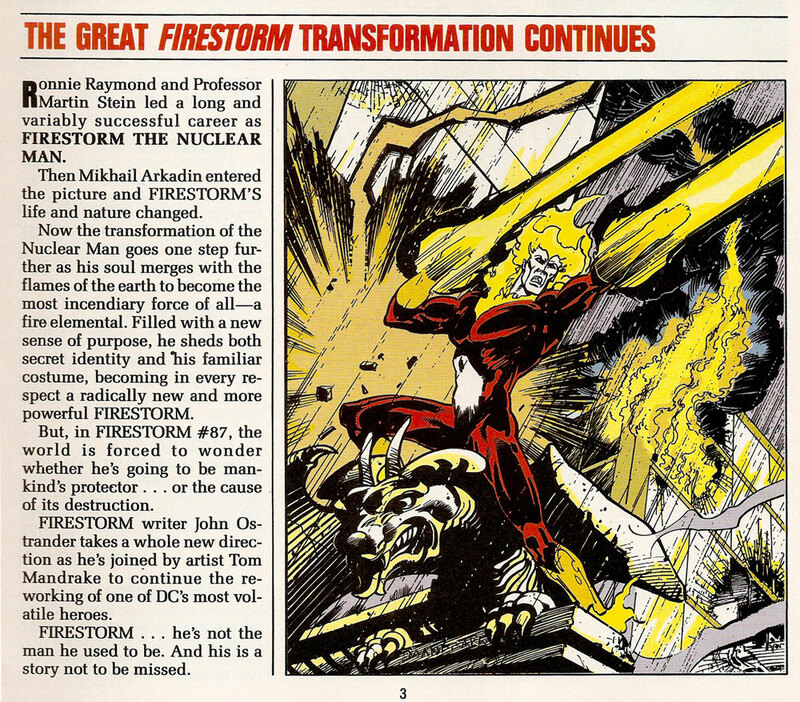 Check out this cool promotional blurb from Direct Currents #16 about the coming of the Elemental Firestorm! Click the image to enlarge! Man, I love me some Elemental Firestorm! That piece makes we want to break out those issues and read them all over again! If you aren’t familiar with Direct Currents, they were a free promotional magazine containing approximately 8 pages soliciting the titles being released by DC Comics that month. My local comic shop didn’t typically carry Direct Currents, so it was always a treat to find one in other shops. My thanks to Michael Bailey of the Fortress of Baileytude sending this scan my way! Posted in: Advertisements, Comic books, Firestorm #03: Elemental I (Ron/Mikhail/clone), Firestorm comic vol. II, John Ostrander, Tom Mandrake. When I was young, I was never really a fan of this era, as it was too “serious” IMO. Now that I have an open mind, maybe I’ll check it out again. The cover to #94, though… best cover ever.